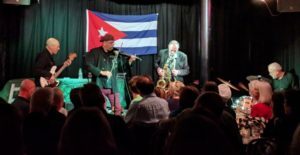 CSC North London decided back in the Autumn that putting on a benefit concert would be a fine way to raise money for the Play for Cuba Appeal which, apart from the instruments themselves, needs funding for the cost of the container and travel costs. Over the few months around Christmas working closely with Rob Miller we prepared and promoted the event and when the night came round it lived up to all expectations. We opened with the sweet tones of Ahmed Dickinson’s classical-style guitar; next, in a complete change of mood the Near Jazz Experience (NJE) belted out a great set which had those of us standing, dancing. Following them, Omar Puente soloed for twenty minutes in his inimitable style on electric violin and then, as a finale, Omar played with the NJE. Kevin Courtney, Joint General Secretary of the NEU/NUT, spoke about why there is a need for the instruments and how impressed all the NUT delegates to Cuba have been with the education system which values cultural education equally other areas. 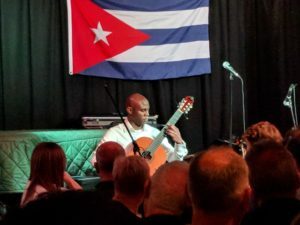 It was a memorable evening music-wise but also a huge success, both in terms of spreading the word about the appeal and in raising over £1000 towards the costs. Thanks to all involved, especially the musicians who gave us their time and talent for free.